This blog accepts cash advertising, sponsorship, paid editorials or other forms of compensation. Please contact us below if you have a product or service you would like us to review or feature in an upcoming post. 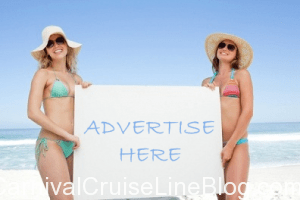 If you are interested in advertising your business and/or product on the Carnival Cruise Line Blog, please contact us using the form below. Add to your RSS reader, and get updates delivered to you! Jamaica working on Improvements to Grow with the Cruise Industry. Book Now! Backstreet Boys Return!